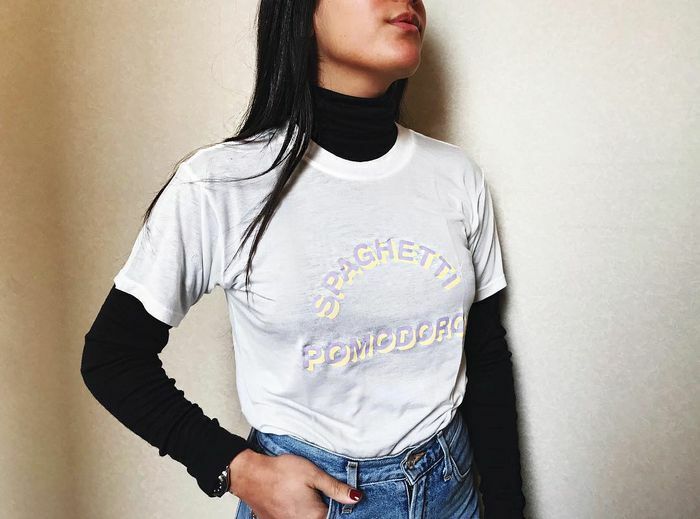 Several brands, like Dolce & Gabbana, Reformation, Topshop, Urban Outfitters, and even Forever 21, have all recently featured tees donning Italian locations, words, or even pasta dishes. Do we sense a new trend bubbling up? Most definitely. But what do we owe this unexpected obsession with all things Italian? Personally, I think the rise of Italian culture in 2018 can be attributed to many different factors. Lately, it seems like you're surrounded by an aspect of Italian culture in one way or another almost everywhere you look, whether it be a new restaurant, shows dedicated to Donatella Versace, or the plethora of vacations It girls have taken to the Amalfi Coast, Rome, and beyond. However, for me, this obsession with Italian culture (and the cool graphic tees that now come with it) is much more personal. This deep admiration stems from my Italian heritage and my initial attraction to the world of fashion. Growing up, both of my parents would always talk about the legends of Italy's past, and it was through their detailed storytelling that I learned about everyone—from the original couturiers like Le Sorelle Fontana and Elsa Schiaparelli to fashion icons like Sophia Loren to visionary legends like Gianni Versace (who actually comes from the same region in Italy as my father—shout out to Calabria). Fast forward to today: It girls like Giorgia Tordini, Gilda Ambrosio, and Chiara Ferragni dominate the Italian fashion scene and are truly on the cusp of becoming icons themselves. Not only are these girls wildly chic in more ways than one, but they also possess seriously admirable qualities that are worth noting. For Ferragni, building a fashion brand from the ground up to become one of the most prominent names in the Milanese sphere and beyond is no joke, and neither is becoming one of the most successful influencers by creating and breaking your own standards (so much so that Harvard Business School even did a case study on her social media success). So for whatever the reason, Italian culture is having a moment—one we shouldn't ignore. The concept of Italian motifs, locations, and words written on tees and sweatshirts alike is somewhat of an unexpected and uncommon trend, but it's one I have instantly gravitated toward and I think you will too. Ahead I've gathered the Italian graphic T-shirts I'm loving right now for you to shop. Because at the end of the day, who doesn't want to show off their favorite pasta dish on their T-shirt? Wear your appetite on your sleeve—or your shirt. This embroidered sweatshirt is just about my favorite thing that exists right now. Anyone up for a gondola ride? This crisp, slim-fitting tee is the actual key to my heart. Available in sizes 36IT to 50IT. When you're feeling ultra whimsical, opt for this graphic tee. Heavy on the carbs, please and thank you. Two of the most important words in my vocabulary. Straight from Italy's biggest Instagram influencer herself. "Hello, beautiful" sounds prettier in Italian. A basic printed tee to show some love. By definition, a term given to sudden and unaccountable changes of mood or behavior. Say hello to the softest cotton tee. When in Rome, do as Fausto does. So whether or not you're planning on hopping on an Alitalia plane in the near future, this super-easy and accessible trend is definitely something you can embrace and apply to your everyday life, hopefully with a heightened sense of appreciation for all things Italian. Buona fortuna! Up next, find out the five secrets on how you too can dress like an Italian It girl—beyond just tees.